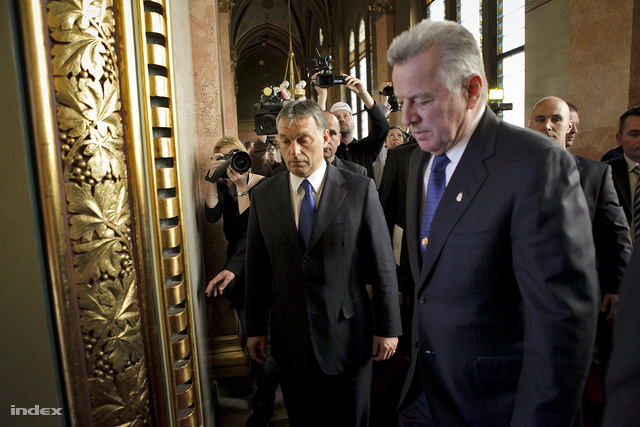 Due to the high public society, civil and wide spectrum political pressure Pal Schmitt President of Hungary resigned from his mandate today in speech to the Hungarian Parliament. The known plagiarism scandal regarding his doctoral dissertation deeply shocked the Hungarian society. Schmitt’s today’s quick decision to step down was a bit surprising but well expected after last week Thursday his (in 1992 awarder) Doctoral Degree in a 2 rounds controversial process (in the first round committee found that it is not his fault but in the second round senate found that it is) was finally withdrawn (also because the pressure and demonstration of the students board of the Semmelweis University) by the senate of the Semmelweis University following the clear evidences (first was published by HVG magazine) shown that more than 90% of his 215-page dissertation had been simply translated and improperly copied without attribution from a Bulgarian and from a French scientists previous works. After his famous last Friday TV interview in which he said his conscience is clear and that he will remain in his office people expected longer and an even more controversial misery process but his step down today is a clear sign from the governing FIDESZ party and PM Viktor Orban that public opinion and people’s moral has still stronger power in Hungary than the political powers and democracy is still working.